I gladly come back to this hostel again as it is a pleasant place. And there are some good reasons for that: – The hostel is located in a quiet area, the staff is extremely helpful. In the evenings you have a comfortable lounge to relax, where you can watch TV, read a book or have an interesting conversation. The dorms are clean and if the temperature allows you can eat in the open. When I come to Auckland again I'd loved to to come back to hat place. It"s the third time there. This is he best reputation for it. The hostel is located in a quiet area. The staff is extremely helpful. I would choose another hostel when in Auckland Kitchen kis small but you will find everthing you need. If it is warm you can eat in the open. All in all for me a perfect stay. This is a welcoming familial hostel in Auckland with a cosy TV and books room, nice bed rooms, a good kitchen and a pretty dining room. We enjoyed our stay a lot! Very nice hostel. The atmosphere was great, the people nice and the staff tried to help if you have questions. Also free lockers for your stuff (you have to bring your own lock). It's a little bit of a walk to the city but that's manageable. Price is ok. The staff were very friendly and helpful. 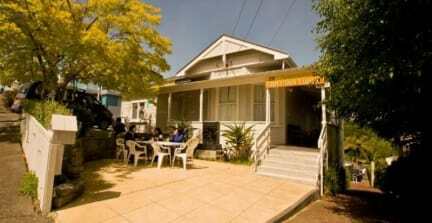 Lantana Lodge is situated in a pleasant leafy neighbourhood very close to a great food market (Sat and Sun). As the hostel is not too big, there is a nice atmosphere. Its a good place, clean and nice location, still good to walk to the city center and the best thing is that there is free parking (just 3 spots though) or bit restricted parking on the road. The biggest flaw are the older longterm guys (staying for a year or so) that add drama and negative mood. Just restrict the stay somehow, would be better for everybody. Girls would feel more comfortable without creepy dudes around and these guys can get a proper flats. Mein Aufenthalt in diesem Hostel war im Großen und Ganzen in Ordnung für 2 Nächte. Der Check-In war recht einfach und verlief reibungslos. Die Hochbetten waren recht wacklig, da sie nicht aus Holz oder m assiverem Material bestehen und quitschen dementsprechend bei jeder kleinen Bewegung. Duschen/Klo's waren ziemlich runtergekommen, dennoch sauber. Die Ausstattung der Küche war ausreichend. Der Weg ins Zentrum waren ca. 25 min zu Fuß. The showers and toilets are in such bad conditions! You don’t even want to touch them. Das Preis-Leistungsverhältnis war echt mies. Die Austattung ist heruntergekommen und es wird versucht möglichst viel aus dem heruntergekommenen Haus herauszuholen.